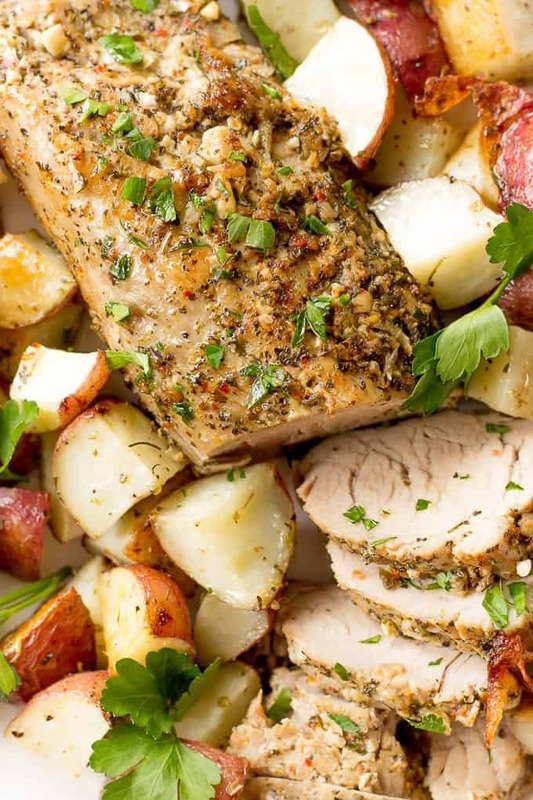 Succulent, Herb Roasted Pork Tenderloin (Buzhenina) that hardly takes any effort to make. Classic Ukrainian recipe that uses 4 ingredients and never disappoints. I don’t do much pork recipes. That’s why you’re seeing less of them on my blog. However, when I do make pork for dinner, my favorite recipe of all times has always been Buzhenina. It’s my mom’s recipe and whenever I make it, it always comes out delicious. My favorite part about this recipe is that it requires only 4 ingredients and extremely easy to make. In Ukraine Buzhenina is an essential part of Christmas and Easter menu. My mom usually observes fasting for lent and tries to abstain from meat or seafood. So when she gets home from Easter church service (we’re talking 3 am), she refuses to go to sleep until she takes a good bite of flavorful Buzhenina along with Paska and some other food that has been blessed in church. She says that food is too flavorful not to eat it right away. Although bursting with flavor, Buzhenina doesn’t require complicated ingredients. 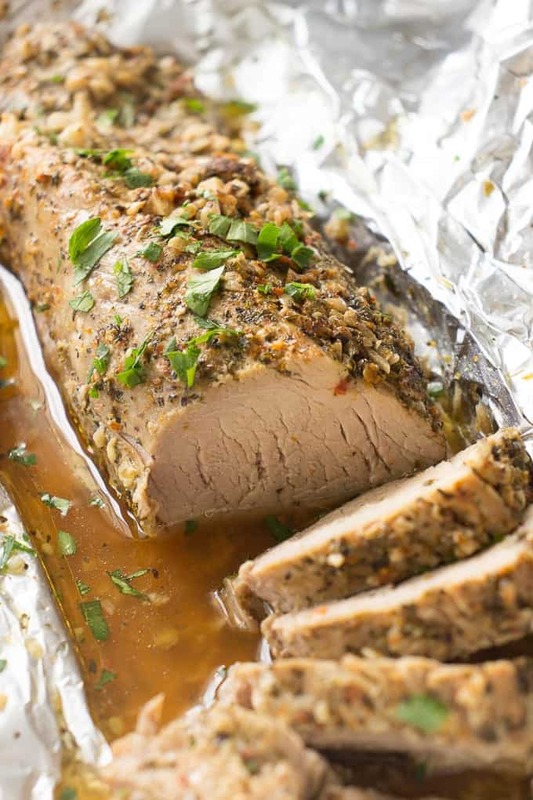 Good quality pork tenderloin, garlic and some olive oil are the base of any Buzhenina recipe. 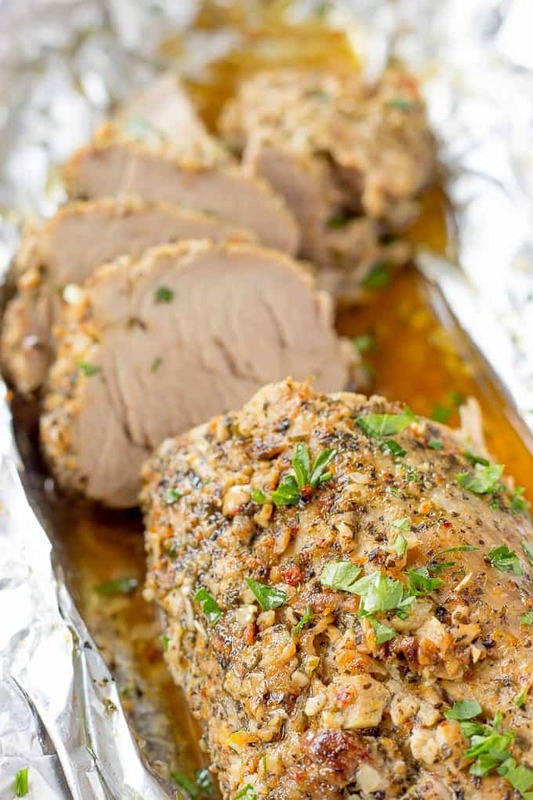 In my version of this Ukrainian Herbed Roasted Pork Tenderloin I added my favorite spice mix – Tuscan seasoning. Lately, I’ve been obsessed with adding it to literally all of my recipes. It gives the final dish and incredible aroma and taste. That being said, pork pairs great with so many other herbs. What Spices Go Well With Pork? 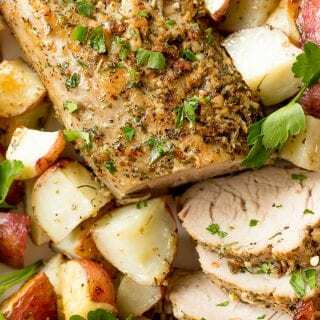 thyme – has mild minty flavor and works well in almost any pork marinade. I recommend starting the night or at least 2 hours before the actual cooking process. 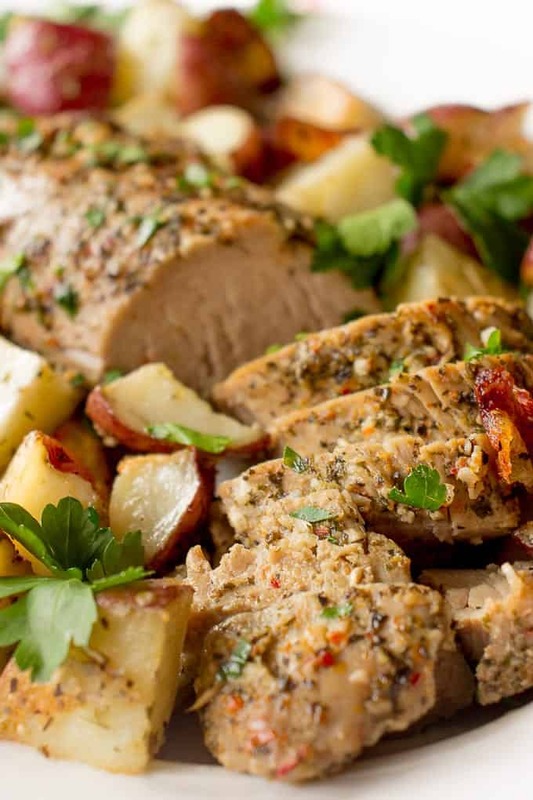 That way, the simple marinade will have ample time to infuse pork tenderloin making it especially succulent and flavorful. Take a large zippered bag, add garlic pushed through a garlic press along with Tuscan seasoning, olive oil, salt and pepper. Place pork tenderloin inside the bag coating it evenly. Place the bag in a fridge for at least 2 hours. At this point you can start preheating your oven to 360 F and also heating your non-stick skillet over medium heat. Also, go ahead and add a tablespoon of olive oil. Remove pork from the plastic bag and sear it for 4-5 minutes on both sides until it’s nice and slightly brown. Now all you have to do is wrap seared tenderloin in 2 pieces of aluminium foil and roast if for 1 hour. That’s it. Easy-peasy, delightfully delicious! If you make this easy Buzhenina recipe, snap a photo and post it on Instagram with a hashtag #lavenderandmacarons. I love seeing your creations. In a large zippered bag, add garlic, Tuscan seasoning, 2 tablespoons of olive oil, salt and pepper. Place pork tenderloin inside the bag coating it evenly. Place the bag in a fridge for at least 2 hours or overnight. Heat 1 tablespoon of olive oil in a large non-stick skillet over a medium heat. Remove pork from the plastic bag and sear it for 4-5 minutes on both sides until it’s nice and slightly brown. Wrap seared tenderloin in 2 pieces of aluminium foil, place it on a baking sheet and roast for 1 hour. Remove from the oven and let Buzhenina rest for 15 minutes before cutting it. Serve with my Garlic Mashed Potatoes or simple baked potatoes. If you don't have Tuscan seasoning, simply use dry oregano or thyme. Very good dish for any holiday!